In the beginning, there was the first marketing technology landscape. And then it grew. And grew. And grew. And grew. And grew. And, yes, this year it grew again. I was surprised that it grew as much as it did as fast as it did. I was surprised that it became as “popular” (love it or hate it) as it did. I was surprised that I was able to talk Anand Thaker and eventually Blue Green into helping me with it after it ballooned beyond a scale that one person could manage (for which I am immensely grateful to them). But the most unexpected surprise was the national martech landscapes inspired by it. First, there was the Canadian marketing technology landscape, with 282 martech companies based in Canada. That was then followed by the Finnish marketing technology landscape, with 117 martech companies based in Finland. And when I was in China earlier this month, I saw no less than three different Chinese marketing technology landscape graphics, sporting hundreds of martech companies based in China. 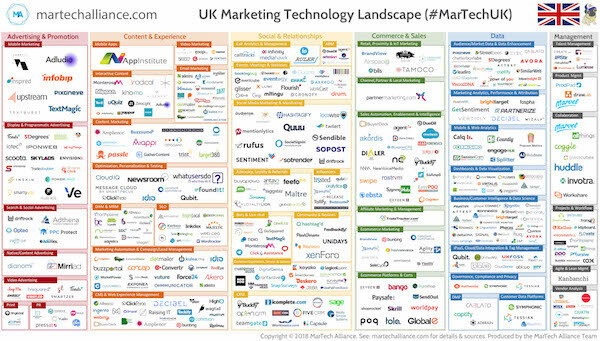 Now, this week, Carlos Doughty launched the UK marketing technology landscape, with 417 martech companies based in the UK. (Click through to his site for a hi-res version.) Note that he found 100 martech companies that weren’t on our global martech landscape. Martech has become an Olympic sport! I didn’t see that coming. Captain Obvious Statement #1: Marketing technology is a global phenomenon. Obvious, but still remarkable, and as a second-order effect, clearly driving the rise of marketing technologists and the martech profession. Captain Obvious Statement #2: The barriers to entry in marketing technology — well, really, any SaaS product — are universally low. Anyone, anywhere can be a software entrepreneur. Again, obvious but profound impact that’s reshaping the software industry. Slightly Less Obvious Statement #1: There are regional markets for marketing technology solutions that hold their own against the large, global players in the industry. These global and local players will collide, but I don’t think it’s a guaranteed win for Goliath. “All politics is local,” they say. It’s possible that, “Most marketing is local too.” Consider the highly local nature of marketing agencies for the past 50 years. Slightly Less Obvious Statement #2: The global winners will come from all four corners of the earth. This isn’t a shoe-in for the Bay Area or even New York City. Even in the US, note that the majority of martech companies on the 2018 Inc. 5000 list come from other cities and states. Derivation of Slightly Less Obvious Statement #2: The giant martech companies will most definitely be acquiring internationally. One of the pioneers of this strategy was Adobe, who acquired, Day Software, which was based in Switzerland, as the foundation for their web content management platform, Adobe Experience Manager (AEM), and Neolane, which was based in France, as the seed for their marketing automation solution, Adobe Campaign. 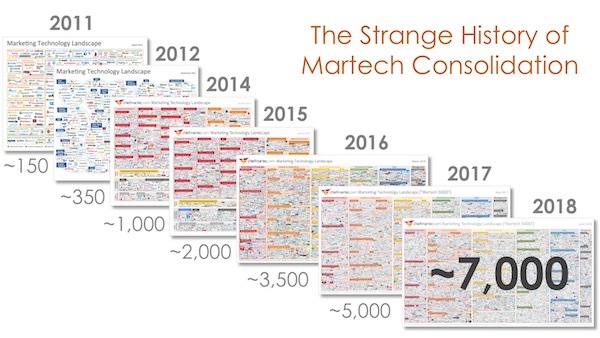 Martech is a fascinating space, isn’t it? P.S. Shameless plug: speaking of how fascinating the martech industry is, check out my preview of the upcoming MarTech conference in Boston. Reminder: this is your last week to get tickets at our discounted “beta” rate — prices go up after September 1.